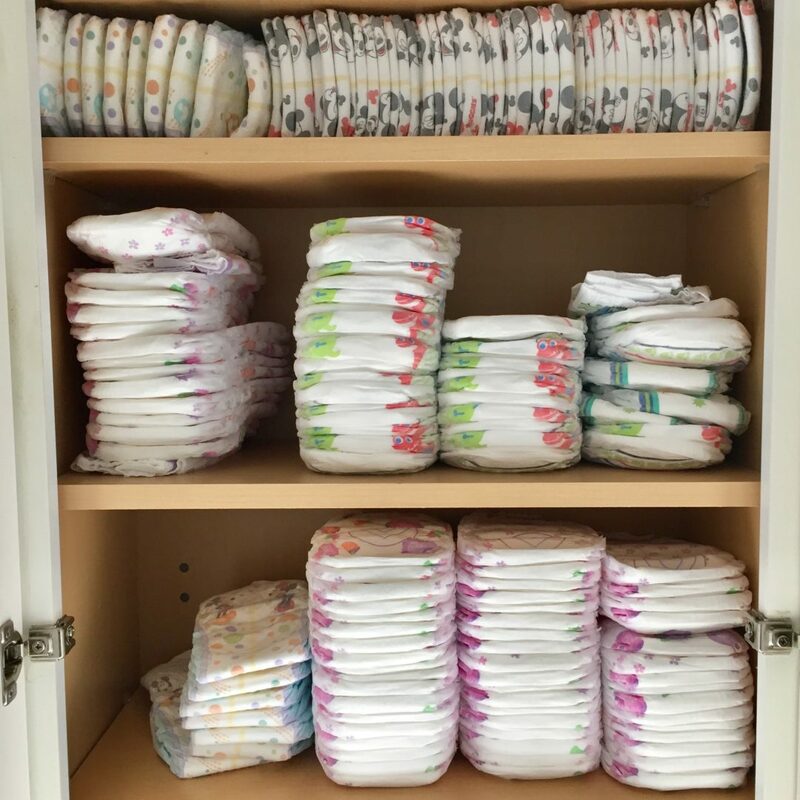 The cabinet gets filled at least once a month, and each time I stare at the shelves of diapers and pull-ups and wonder, “Is this the last time I’ll do this? Are we getting close to the end? When will this season be over?” Nine years — and counting — that we’ve been changing diapers. There was a two-month break in 2012, right before our third child was born, but other than that, the most consistent thing in my mothering has been the buying, changing, and disposing of diapers. It’s a never-ending cycle and lately I’ve been feeling weary from the monotony–and let’s be real, the disgust–of changing multiple diapers every day. Last summer we found out that we would be remaining in Virginia for another four years. This would be the longest we’d lived anywhere in our 11 years of marriage, and while I was thrilled to not have to put our home on the market, pack up boxes, and think about relocating our family, I was terrified. I remember saying to a friend, “I don’t know how to be a 7-year friend.” Our life was somewhat nomadic, settling in to a home and church for 12 months-3 years, and then leaving to start over somewhere else. We tried to dig roots in each place, but no matter how hard we tried, the roots could never get too deep. As I talked with my friend, we began likening both of our journeys to a marathon. She had 12 years of consistency: same church, same friends (for the most part), same city. For her, the current challenge looked like continuing to stick through the rough patches that inevitably come the longer you live somewhere. For me, the challenge would be facing some of those growing pains that only happen over a longer period of time. We were both running a race, just at different stages of the journey. Just like friendships or rooted-ness that span the course of years, motherhood will last a lifetime. There isn’t an end. Yes, the seasons will change, the trials will differ, and your life won’t look the same ten years from now, but you will forever be marked by this piece of your identity. Through giving birth to your own babies, adopting someone else’s flesh and blood, or spiritually investing in the lives of those younger than you, the responsibilities and bond of motherhood march on. Day in and day out you love, serve, and give of yourself, your time, your talents, your energy, sacrificing yourself for the good of others. Many days it comes without reward, or at least tangible ones. You will not receive praise or even a thank you. You will keep going because it’s who you are, but that doesn’t mean it always feels good. A runner diligently and consistently trains for a marathon. She runs in the rain, in the heat, in the cold. When her legs are sore and her body is weary, she laces up her shoes, stretches her muscles, and continues putting one foot in front of the other. She fuels her body for the task, paying careful attention to what provides energy, and eliminating the things that slow her down. She lightens her pace when necessary and speeds up through bursts of energy, but she never gives up. Her goal is in sight: finish the race well. Your life as a Mom will require diligence and consistency. You will be uncomfortable. Your body will be weary, your mind empty, your soul stretched thin. You will need to pay attention to what empowers you for the task and eliminate the things that weigh you down. There will be days when you joyously skip through the responsibilities before you and days when you can barely pull yourself out of bed. But you won’t give up. Your goal is in sight: be faithful and glorify God today, in this mundane moment. Changing diapers for 9.5 years is but a small taste of enduring a struggle. Yes, I would love to see my almost six year old son learn to use the potty. Yes, I struggle with anger most days when he has an accident in his pull-up, refusing once again to communicate his needs to me. Yes, the reality of his Down syndrome can often feel too overwhelming and never-ending. But it’s in this battle of constantly meeting someone’s needs in the face of my own inconvenience that I learn to persevere. Shortly before Jesus went to the cross, he spoke to his disciples about suffering and persecution they would face. He told them to persevere, to stand firm, to be on guard to the end. But he didn’t just talk about it; Jesus lived it out. Peter, from a distance, watched Jesus face an unfair trial, be spit upon, mocked, beaten, and he saw Jesus do this in silence, never putting up a fight or trying to walk away from the inevitable acts of injustice he endured on our behalf. Jesus was the ultimate picture of perseverance in the face of struggle, and it’s because of the suffering he endured that we are able to endure through the trials and struggles of this life. On the night before his death, Jesus washed the feet of his disciples, knowing that they would all be scattered upon his arrest and trial. He served them and loved them in spite of their upcoming betrayal. When I think about the way Jesus responded to a much deeper loss than inconvenience, I can persevere through the years of potty training, dependent upon his strength and the character that he exemplified. If we were to make a list of a mother’s hopes, it would probably be quite long. You hope for your children’s health and safety. You hope that they will love God and love others. You hope that your newborn will sleep through the night early on and never wrestle with colic. You hope for good grades, wise choices in their adolescence, and success in adulthood. But no matter how we sanitize their environment, instruct them in God’s Word, sleep-train them from the beginning, or how we educate them, the truth is that there are no guarantees. We cannot control any outcomes for our children. For some, this could feel depressing. But in light of the gospel, this is freeing. Because each of these smaller hopes that produce nothing certain, point us to a greater hope that is secure. The Greek word translated hope in Romans 5:3, literally means ‘the expectation of what is sure.’ When we persevere through the struggles of this life, our character is developed, and hope — the true kind — is produced. I can’t make my children turn out a certain way, but I can put my hope in the certain way of eternal salvation: Jesus. My inability to control outcomes gives me a greater ability to rest in the fact that one day my salvation will be made complete. 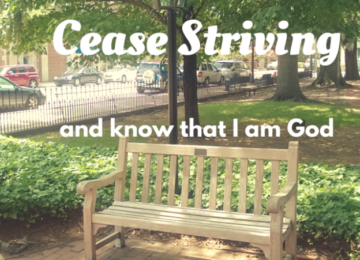 Jesus has already finished the work to bring me peace with God (Romans 5:1), and one day that work will culminate in my glorification when I see Jesus face to face. This life is not the end. Hallelujah! Diapers, tantrums, sleepless nights, homework, soccer tournaments, sibling disputes — you fill in the blank with your current situation — these will one day cease. Jesus will return and he will make all things new. There will be no more struggle, no more sickness, no more disability, no more strife, no more irritated parents, no more disobedient children. The challenges you and I face as a Mom will forever be erased when we stand in the presence of Jesus. But it’s in the longing, in the struggle, in the midst of the daily grind of motherhood that we are pushed toward this reality. If life was perfect and easy, we would grow comfortable and pleased with the present. God wants more for us because he knows that something better is coming. This is why he allows the struggle. Even if all of our mothering dreams came true, there would still be a void. He wants the longings we feel to awaken within us the realization of a deeper craving. We were created for God. And when we experience the longings that come with motherhood, we’re reminded that true fulfillment and satisfaction can only be found in the fellowship that we’ve been given with Father, Son and Holy Spirit. This fellowship is ours to enjoy in the present and in the future. We can live it out when we persevere through the duties of motherhood, dependent upon Christ at work in us to enable us each day. We live it out when we confess and repent of the sins we commit in our roles as Moms. We live it out when we hope in Jesus — not the outcomes — in the midst of the struggles we face. We live it out as we turn the eyes of our hearts toward the certain hope of heaven where we will forever be with God and all of the cravings and longings of our hearts will be fully met. Excellent, Lauren! Thank you for sharing all this, expressed so beautifully from a heart that has experienced the depth of these truths. I have been meditating on Heb 12 this week, and love verse 3, as well….”Consider him who endured from sinners such hostility against himself, so that you may not grow weary or fainthearted.” Love you! Lauren, this is timely and I appreciate your encouragement! My older kiddo turns 9 today and is still not potty trained, and I have been feeling so discouraged! Your posts always encourage me to turn to the Lord, whatever the particular burden may be. This is beautiful. Thank you, Lauren!